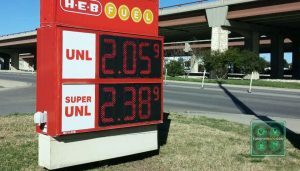 The price of gas took another leap higher during the past week, according to the latest report from the U.S. Energy Information Administration. The weekly E.I.A. report shows the cost of gas jumped eight cents last week, and that followed a week in which prices jumped 12 cents per gallon. In all, however, the price of gas is still significantly lower that it was at this time last year. As it stands, the national average price for a gallon of regular unleaded is $2.27, which is 23¢ higher than where gas settled at the end of January. 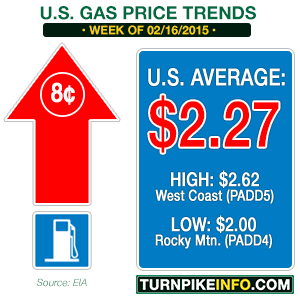 West Coast drivers suffered the biggest price increase, by region, during the week. The E.I.A. survey shows consumer fuel costs jumped 15¢ per gallon, by far the highest increase nationwide. The runner up, the Gulf Coast states, had a price increase of nine cents per gallon. Prices along the Gulf Coast have been rising faster than other regions. Photo: Eric Scallion. The numbers by state are equally dramatic. In California, which lead the West Coast price surge, the coast of a gallon of gas soared over 17¢. In Florida, where early spring break travelers will soon be arriving for vacation, the cost of filling up rose 12¢ per gallon. Diesel prices are also rising, but not as severely. The average cost of a gallon of diesel, nationwide, settled at $2.87 this week, which is up three cents over last week. However, like regular unleaded, diesel prices went up considerably more along the West Coast, particularly California, where prices were up eight cents per gallon. The current price rebound in gas and diesel can be attributed, at least in part, to the leveling of crude oil prices, which had been in a free-fall for several months. However, both West Texas Intermediate and Brent Crude have stabilized. WTI, a domestic futures benchmark, has been trading in a range between $48 and $54 per barrel for the past two weeks. Brent has been trading in a wider range, but traders have been bidding Brent higher, unlike WTI. What is more, Brent closed above $60 per barrel for two consecutive sessions this week before sliding just under that key threshold in Wednesday trading. Meanwhile, as much as gas prices have done an about face in recent weeks, the year-on-year numbers are still staggering in their consumer favoritism. The average driver is currently paying about $1.10 less for a gallon of gas than last year at this time, and some regions are enjoying prices that are about $1.25 less than a year ago, including New England and the Rocky Mountain region.